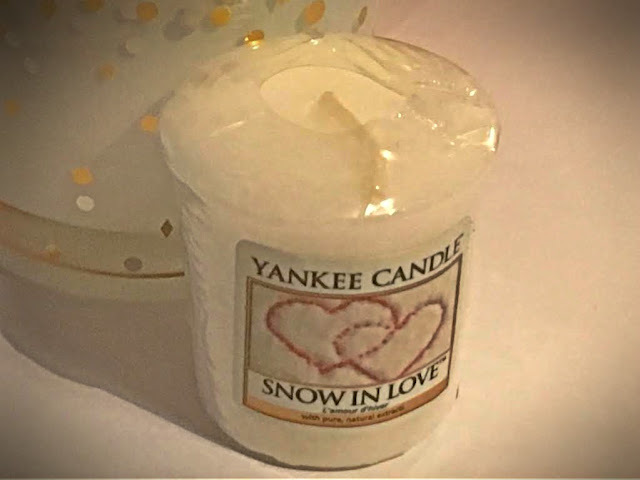 What could be more perfect than a candle which sums up these last few days, Snow and Valentine's Day? The answer is Yankee Candle's Snow in Love fragrance. I have this candle in a votive form so it's just a small little taster of the candle, but I really like it. It smells very musky and powdery and fills the room beautifully with its fragrance. The votive candles are said to last around 10 hours of burning time so for £1.99 its good value of money. I've said in a previous Yankee Candle review that the votives are a really good way of sampling of different fragrances before you commit to spending a little more on the jar sizes, and especially for seasonal fragrances I think a votive is just about adequate because they don't last as long as the bigger sizes. I'm currently using a glass candle holder from Yankee Candle which is white with a gold confetti effect, the candle holder along with the Snow In Love votive came as part of a set I received at Christmas. I really like the fragrance, and it's not something I would usually pick up so I'm happy I've tried it and found another fragrance I like! Let me know if you've tried this fragrance or another Valentine's appropriate candle?